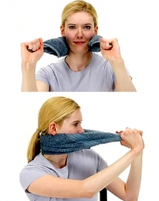 Tuck your chin in, flattening your neck back into the towel. Slowly draw your chin back so that your ears line up with your shoulders. Turn your head to one side as far as you can and then use your same-side-hand to assist in turning the head further for a gentle stetch. Tilt your head to the side (ear to shoulder) making sure to keep your eyes and nose pointed straight ahead. Position a small hand towel behind the neck, holding the ends of the towel forward as shown. Next, extend your neck back and upwards as if looking up to the ceiling. Then, return to starting position. Your hands should follow your eyes during the movement. Place one hand behind your back and gently draw your head towards the opposite side with the help of your other arm. Place the arm on the affected side behind your back and use your other hand to draw your head downward and towards your armpit. Start with a small hand towel positioned behind the neck, holding the ends of the towel forward as shown. Next, rotate your head to one side; then return to starting position. Your hands should follow your eyes during the movement. While standing in a doorway, place your arms up on the door jam. Slowly walk forward through the doorway until a stretch is felt along the front of your chest and/or shoulders. Slide your hands further up the door jam to alter the stretch.